“Thank you for taking the time to write. Have you met Kate Swaffer? She is a kindred spirit, who also lives in Australia, of ours who hears the same messages as we do. Remember since no one really can know what it is to live within Alzheimer’s Disease except those who do live within its walls, others are actually telling you what they believe, not necessarily what is true for you. It’s too bad others can’t accept us for who we say we are when they expect us to accept them for who they claim they are! We can’t fully appreciate caregiving unless we are a care giver, we can only approximate how it feels by comparing it to our expectations and own substitute experiences. Thank you Richard for allowing me to share this personal communication. Richard is fighting for his life with yet another terminal illness (oesophageal cancer) and is undergoing radical treatment with the same incredible bravery as he has with dementia. His refreshingly honest sharing of his personal dementia journey saved me when I was first diagnosed; he taught me there is life after diagnosis, and it is right to stand up and speak out from our perspective, and for what needs changing. 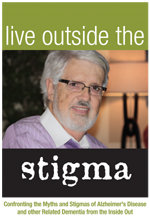 It is right to live beyond the stigmas and expectations of others, to live beyond their discrimination. Think I might ride shotgun on the next garbage truck and give the doubters something to think about! Bastards! You’ll have to pack a very big packpack as it will mean a trip all over the world!!! I don’t know why anybody would make up having dementia. But given the reaction from some of our family and friends, I know why people wouldn’t be brave enough to talk about it. It is an unfortunate way to find out who you can really depend on.